After the boning channels had been sewn in, as outlined in my previous post, the three sections of the bodies were then whip stitched together from the wrong side as Janet Arnold has noted was done in the original. For this I used linen thread, not silk, as it is much stronger and would be able to take the strain of movement much better. Once the three separate pieces that make up the bodies were sewn together I then added the boning. There is a gap between the binding and the boning channels of “between ¼ inch (6 mm) at the centre back to 1 inch (25.4 mm) under the arms, and ½ inch (12.7 mm) at the front” in the original effigy bodies. Not only would this have been more comfortable for the wearer, particularly under the arms, but according to an experimental investigation into the ‘Holbein look” of the early sixteenth century, Jane Malcolm-Davies, Caroline Johnson and Ninya Mikhaila noted that on both the Von Neuburg and Effigy bodies it was found that leaving this small area around the neckline unboned achieved the “sprayed-on look” of the period, and stopped the bodice gaping at the front. Like the baleen, called whalebone during the sixteenth to eighteenth centuries, originally used in bodies, I was able to cut and shape the modern plastic boning in order to fit into the differently shaped boning channels. Traditionally, after the baleen, a substance made of keratin that is part of the filter-feed system of baleen whales, was extracted from the whale it went through a process in order for it to be used in clothing. This involved heating or boiling the pieces of baleen until they were soft and pliable, then they were cut into thin slices of the desired width using a special knife as is shown in this eighteenth-century French engraving. For an extremely interesting post on cutting and using baleen, check out Abby’s blog post here. In order to stop the sharp cut edges of the boning from punching a hole in the silk taffeta as I inserted them, I used a cigarette lighter to slightly melt these sharp edges. After the boning was inserted into the channels, I then sewed a line of half back stitching in silk thread above the top of the boning channels to secure the boning inside. In other examples of seventeenth-century bodies, extra binding has been added around the bottom of the boning channels, underneath the binding ribbon, in order to stop the boning perforating the binding and poking through. Binding reinforced with strips of matching silk satin on Dame Filmer’s Bodies, c. 1630-1650. Gallery of Costume, Manchester. Photo by author. The effigy bodies, however, do not have this extra protective binding. According to Luca Costigiolo this is probably because these bodies were quickly made for the Queen’s funeral effigy and were never intended to be worn and therefore wear and tear of everyday life. I decided to stay true to the original and not add this extra protection to my reconstruction, as, besides the movement experiments I intend to perform, these bodies will also not see normal wear. For the binding I used nearly 5 metres of 16mm-wide grosgrain ribbon. To attach the binding first I used a half back stitch to stitch the binding to the right side of the bodies, leaving a couple of millimetres between the edge of the taffeta and the edge of the ribbon. Then I folded the ribbon over the raw edge and then felled using a whip stitch onto the wrong side. These whip stitches did not have to be super close to each other, as other surviving examples from the period show that there was at least a gap of a few millimetres, sometimes even 5mm, between each stitch. Adding boning shrinks the bodies, so my reconstruction is actually a tiny bit smaller than the original. I lost about ½” on the waistline because of this. As the measurements and therefore pattern for these bodies was taken from a completed surviving garment, the original measurements used by William Jones, the Queen’s tailor, would have been slightly larger. This is something that all tailors would have had to have taken into account when constructing bodies or other fully boned bodices for their clients, and is something that I will definitely keep in mind for the next pair of bodies I intend to make. Centre back waist measurement AFTER boning added. Nearly a 1/4″ was lost. If you’ve read my first post about the materials I intended to use for this project, you will recall that I was originally going to use leather or faux leather to bind the bodies, as was done in the original. However, when I started the construction process I realised that the fabric I had chosen for the lining and outer fabric, silk taffeta, was far too lightweight for faux leather binding. Even if I could have sourced light kid leather, I still think that it would have been a bit too heavy for the fabric used. Instead, I opted to use a grosgrain ribbon, as was used in later seventeenth century bodies, such as the Filmer bodies (c.1630-1650) in the Manchester Galleries and the Pink Silk Stays (c. 1660-1680) in the Victoria and Albert Museum. The only surviving bodies contemporary to this pair, the Von Neuburg bodies (c. 1598) from modern day Germany were also bound with silk ribbon. Silk ribbon binding is visible on the bodies of Dorothea Sabina von Neuburg c. 1598. Bayerisches nationalmuseum, Munich. Late seventeenth-century example of a green silk grosgrain ribbon used to bind the edges of these stays. Photo by author. Wool, Silk and Linen Stays, c. 1670-1680. Museum of London. In surviving bodies from this period the ribbon binding was felled with thread the same colour as the ribbon, so it blends in with the ribbon and the finishing appearance is quite neat. Due to the limits of my funding, I couldn’t go out and buy silk thread to match the ribbon, and so it isn’t the same colour. This does leave the inside of the bodies looking much less neat than those originals from the century. Analysis of surviving bodies from the seventeenth century also reveals that the binding was sewn on with single ply silk thread. However, I opted to double my thread as the modern silk threads readily available to me are not as thick as the single ply thread used nearly four hundred years ago. The single-ply whip stitching of the silk grosgrain ribbon binding on this pair of stays c.1660-1680 is nearly invisible, as the thread matches the colour of the ribbon. Photo taken by author at the Victoria and Albert Cloth workers Centre. I’ve also learned the merits of binding raw edges in this period. Whereas in modern sewing we would turn the seam under and sew or hem it, it makes sense that on the outer edges of garments during this period they didn’t do this – as fabric was incredibly valuable, costing more than the labour to construct the garment in most cases, and so waste was minimised as much as possible. It also gives a much neater finish to the garment. After the bodies were boned and bound, I then moved on to creating the eyelet holes and other finishes touches, which will be outlined in my next blog post. Janet Arnold, ‘The ‘pair of straight bodies’ and ‘a pair of drawers’ dating from 1603 which Clothe the Effigy of Queen Elizabeth I in Westminster Abbey’, Costume, Vol. 41 (2007), p. 4. Janet Arnold, ‘The ‘pair of straight bodies’, p. 3. Jane Malcolm-Davies, Caroline Johnson and Ninya Mikhaila, ‘And her black satin gown must be new-bodied’: The Twenty-First-Century Body in Pursuit of the Holbein Look’, Costume, vol. 42 (2008), p. 26. Lynn Sorge, ‘Eighteenth-Century Stays: Their Origins and Creators’, Costume, Vol. 32, No. 1 (1998), p. 19. Luca Costigliolo, ‘From Straight bodies to Stays’, Seventeenth-Century Women’s Dress Patterns: Book Two, Susan North and Jenny Tiramani, eds. (London, V&A Publishing, 2012), p. 10. Luca Costigliolo, ‘From Straight bodies to Stays’, p. 10. Janet Arnold, Patterns of Fashion 3: The Cut and Construction of Clothes for Men and Women C. 1560-1620 (London : Macmillan ; New York : Drama Book, 1985), p. 46. After researching the materials that I needed and scaling up the pattern provided by Janet Arnold when she examined the garment in 1994 I then had to cut my pattern pieces. This was done easily and quickly on the grain of the fabric. Pattern pieces right sides together, seam allowances folded over. Over handing seam, pattern piece right sides together. Pattern pieces spread out with overhanded seam visible. Pattern pieces right sides facing outwards. This is how the seam looks from the right side. Centre back lining seam from visible from wrong side of back panel. It was a this point that I realised that my shot silk taffeta was fraying quite a lot in some areas particularly at the centre front. In order to stop this whilst I handled the pieces to sew in the boning channel I added a very non-historical material, sticky tape, in order to stop it. I carefully removed this later when I bound them. Historically, in order to achieve the neat straight boning channels seen in surviving bodies from the seventeenth century, the lines of stitching were evenly mapped onto the right side of the fabric with black ink and then this was stitched over. The traditional method of using backstitches would have then covered most of this visible ink. However, the effigy bodies are different in that the boning channels are running stitched, which is far less sturdy a stitch than the backstitching seen in every other historical example from this century. Luca Costigliolo has noted that this was possibly because these bodies “were made quickly for the Queen’s effigy and were never intended for normal wear.” As my intention was to faithfully recreate most elements of the effigy bodies, I decided to also use running stitches and so did not attempt the ink mapping technique as I knew that the ink outline would be quite visible through the running stitches. As my silk taffeta was a shot silk, when I pricked the fabric, the darker ‘shot’ thread that runs through the fabric became more visible, so pouncing was not needed. For the most part this mark in the fabric is only temporary, so in order to map out my initial boning channels all I had to do was lay down my pattern on top of the pieces and prick the outline of the centre front boning channels through. Mark in fabric made from running point of needle over shot silk taffeta. Finished front panel, running stitches in linen thread. Initially I found the process of achieving the tiny running stitches of the original quite hard. At first my stitches were quite big and wide, so I changed to a smaller needle and this improved. Still it is no match for the original, nor for the minute even stitches that I have observed on other seventeenth and eighteenth century garments. Hilary Davidson also noted this in her reconstruction of Jane Austen’s Silk Pelisse, noting that because the stitching in the original was not exceptional it “was easy to reproduce the stitching to the same scale, unlike many Regency gowns displaying stitches of an even fineness it takes hundreds of hours of practice for the modern sewer to achieve, especially in muslin.” Pictures of my stitching at the start compared to those at the end do show how much they did improve over the hours I spent doing the reconstruction, however, they do not at all compare to a master tailor or even seamstress who had been hand stitching day in and day out from a young age. After completing the boning channels in the first centre front piece I realised that linen thread, although used in the original effigy pair, was much too heavy for these bodies that are made completely from silk taffeta. For those experienced with using these expensive fabrics and historical threads this is probably common sense. However, I had to learn the hard way. As the point of this reconstruction was not only to test ideas of movement and restriction, but also to learn about production methods, I decided to do one of my panels, the second front panel, entirely in silk thread instead. In all the extant seventeenth century bodies that use silk as an outer fabric, silk thread is used to stitch the boning channels. I also decided to use backstitches instead of running stitches, again to see what difference it would make to the garment. Immediately after switching threads, I realised that the silk was MUCH easier to sew with and back stitching, as anticipated, was much more secure. I also realise that I probably should have lined these bodies with a more sturdy fabric such as linen, as was done in the rest of the seventeenth century and throughout the eighteenth. Surviving wardrobe accounts from the period do list lightweight fabrics being used to line bodies, sarcenet (a fine soft silk) was a favourite of Queen Elizabeth I. Taffeta was also widely used as Elizabeth’s wardrobe during the same period list: “Item for makinge of a pair of bodies… of black veluett… lined with Taffata…” An inventory taken in 1608 of Anne of Denmark’s wardrobe described: “One payre of Ashcouler cloh of siluer bodies, bound with siluer lace lyned wth carnacon taffeta” Although these examples do confirm that taffeta was used as a lining fabric at the start of the seventeenth century, it never seems to have been used both as the outer fabric and the lining. There always seems to have been a mix of heavy and light fabrics – such as in the example above where a heavier velvet was used for the outer fabric and taffeta was used for the lining. In many other examples from Elizabeth I wardrobe accounts when taffeta was used for the outer fabric, fustian was used for the lining. When two lighter fabrics were used, such as in the example from Anne of Denmark’s accounts, it is quite possible that these bodies were either more lightly boned or not boned at all. It will be interesting to see how my finished effigy bodies made entirely of silk taffeta will compare to the next c. 1630s-1650s bodies reconstruction that I intend to make (with my own pattern taken from Dame Filmer’s bodies from the Manchester Galleries) which were made with silk and linen, and that I will make with silk taffeta and linen. These are just a few ways in which this reconstruction process is helping me to understand the archival record a bit more as bodies was quite a generic term and could be used to refer to a corset-like garment or a close fitting kirtle bodice. Once I’ve finished my reconstructions and move to the experimental stage of testing size and movement, it will be interesting to see if these different materials make a difference. 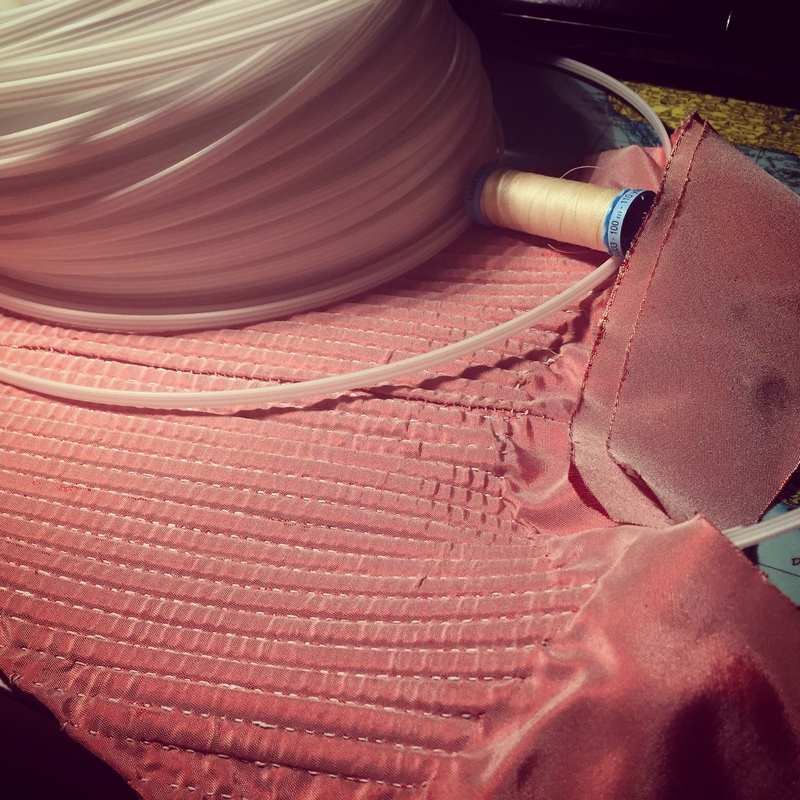 Until then, my experience with boning and binding the bodies will be outlined in my next blog post, so stay tuned! Janet Arnold, ‘The ‘pair of straight bodies’ and ‘a pair of drawers’ dating from 1603 which Clothe the Effigy of Queen Elizabeth I in Westminster Abbey’, Costume, Vol. 41 (2007), p. 6. Melanie Braun, ‘Preparation of the Embroidery’, Seventeenth Century Women’s Dress Patterns: Book Two, Susan North and Jenny Tiramani, eds. (London, V&A Publishing, 2012), p. 56.